In late 1995 the author had the pleasurable experience of flying the F-111 Pave Tack simulator. 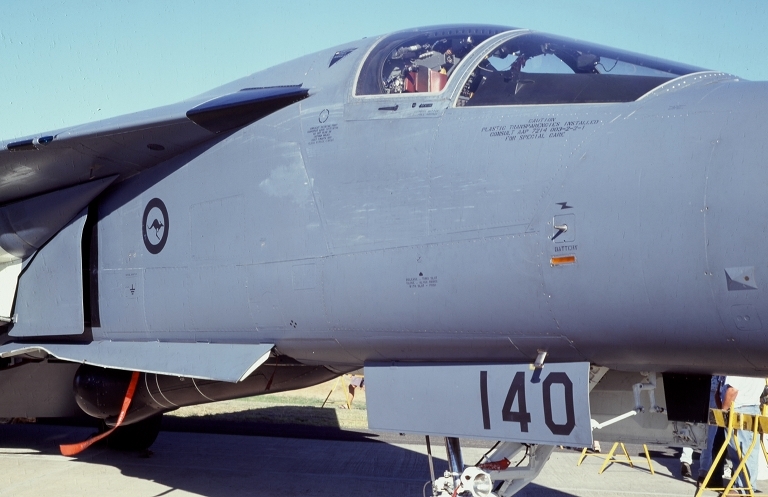 During a short visit to Amberley, the RAAF graciously provided an experienced F-111 instructor, and an hour's time on the then soon to be replaced first generation CAE flight simulator. It was an interesting opportunity to renew an earlier acquaintance, which began in 1983, when the author flew a radar bombing sortie from the navigator's station, using the then current AJQ-20A bomb nav and APQ-113 attack radar (see AA June 84). On this occasion, with a useful amount of instrument and competition aerobatic time under the belt, the author was in a much better position to savour the virtues of the aircraft from a stick and rudder perspective. The author's "Angel Guardian" and instructor on the sortie was Squadron Leader Steve Clarke, an experienced F/RF-111C/G instructor pilot and former navigator, then serving as the 82 WG Aircraft Liaison Officer. Under Steve's tutelage, the sortie was a highly effective learning experience. The sortie commenced with a full afterburner takeoff at 85,000 lb gross weight, which is a typical take-off weight for a training mission. The aircraft configuration was with wing fully swept forward at 16 degrees, 25 degrees flap, slats deployed. Advancing the dual throttles past the MIL detent lights the 'burners, and with pressure off the pedals the aircraft smoothly accelerates as the throttles are moved to the zone 5 afterburner setting, fully forward. The fuel flow is very high under these conditions, at 38-40,000 lb/hr per engine. The Pig is rotated at 140 KIAS indicated, and lifts off the runway at about 155 KIAS. Held at 10 degrees nose up, the aircraft will continue to accelerate, and the gear is retracted almost immediately. Clean and steadily climbing, we wait for airspeed to reach 220 KIAS where we retract the slats and the flap. Flap, slat and sweep angle position are indicated on a small panel just to the left of the primary instrument cluster. Once the wing is cleaned up, we set the sweep angle back to 26 degrees, using the sweep control handle above the throttles. The cockpit sweep indicator responds very quickly, and if movement is both slow and smooth, tracks position as the adjustment is entered. Two climb profiles are used. The more fuel efficient profile uses MIL power (cca 10,000 lbf per engine) at 350 KIAS and an ROC of 2000 to 3000 fpm. The thirstier profile, which we flew, uses zone 5 burner (cca 18,000 lbf thrust/35,000lb/hr fuel per engine), 450 KIAS and achieves 10,000 fpm ROC. The sortie was focussed on examining the envelope of the aircraft and handling over a range of wing sweep angles and manoeuvres. The sixties technology simulator is limited in its ability to faithfully reproduce the finer nuances of the aircraft's pitch and roll response, which are much crisper and cleaner than the simulator portrays. Even so, the handling for small control inputs is very smooth, the Pig is a superb instrument flying aircraft. The pilot's primary flight instrument cluster is the easiest the author has had the pleasure to use, and a good scan is very quickly acquired. The first section of the sortie was focussed on aircraft handling. At 13,000 ft AGL, 26 degrees sweep and 0.8 Mach, I executed an attempt at a full stick 360 degree roll and overshot the recovery, ending up inverted. Rolling upright was easy with a moderate stick input. In this respect the limitations of the sixties simulator are very evident - in the real aeroplane the availability of differential stabilator, outboard and inboard spoilers and analogue control augmentation apparently result in a sharp and clean recovery from the manoeuvre (described as sharper than that of a PC-9). Sweeping the wing back to 45 degrees to lock the inboard spoilers, retaining outboard spoilers and stabilators, the entry into the roll is more sluggish, but the control augmentation will very quickly bite, pumping rotational momentum into the airframe. Again I overshot the recovery. The final roll handling manoeuvre was at 72 degrees (full) sweep and 0.8 Mach. In this configuration the aircraft relies wholly on stabilators and control augmentation. Entry into the roll is still very quick, but full roll rate is achieved at about 180 degrees into the roll with full stick. Overshoot on recovery was pronounced, and I ended up doing full 720 degree roll, the latter part of which was flown with partial stick input. The real aircraft is substantially easier to fly, and the introduction of the new Digital Flight Control System (DFCS) under the AUP upgrade will further improve handling, particularly at the boundaries of the handling envelope. It is worth noting that the Pig has interesting stall characteristics, with the onset identifiable by loss of directional control authority. Should the aircraft be badly mishandled and depart, once a spin develops the only recovery method is the black and yellow handle. The next section of the sortie involved a full afterburning cruise climb from 13,000 ft AGL to 55,000 ft AGL, at 650 KIAS. Holding a constant airspeed, the aircraft's rate of climb slowly dropped as we approached the ceiling. Approaching 45,000 ft I successfully violated the envelope of the F-111A/C engine inlets, causing an immediate engine stall, evidenced by the loud thumping and immediate loss of thrust. Unloading the aircraft and retarding the throttles to MIL was required for a relight, and we continued the climb to 50,000 ft. Upon reaching 50,000 ft, I rolled the aircraft inverted and pulled the nose down to the horizon, before rolling upright. Again, roll overshoot proved to be a problem on recovery. At 50,000 ft and 72 degrees sweep we commenced a high speed level run to demonstrate supersonic performance. In full afterburner (the joy of simulation, we topped up the tanks with a call over the ICS), the Pig steadily accelerated to 2.6 Mach, beyond the placard envelope. Under these conditions, the real aeroplane will eventually experience skin heating, causing the paint to cook off and peel from the leading edges. Handling is smooth but the load envelope is very limited under these conditions. Rolling to 60 degrees and applying back stick, the stall warning goes off at 2.5 to 3 G load factor. The aircraft is flown using the Terrain Following Radar (TFR) to provide automatic pitch control inputs to maintain a set terrain clearance of 1000, 750, 500, 400, 300 or 200 ft, with soft, medium or hard ride settings determining the rate at which the aircraft tracks the ideal line of terrain clearance. Altitude is determined by radar altimeter, and the TFR E-scope provides the pilot with an indication of terrain profile ahead. This is required for throttle handling, as the pilot must maintain airspeed as the aircraft climbs over obstacles. The E-scope displays two curves, the upper "command line" to which the aircraft is flown, and the lower terrain profile curve. Once the TFR is engaged, the horizontal "fly-to" command bar on the ADI (AH) and the LCOS (gunsight) are slaved to the TFR. The configuration for the toss bombing delivery is 550 KIAS and 44 degrees of sweep, in this instance at 400 ft terrain clearance altitude. Toss bombing is the preferred low level delivery method for laser guided or electro-optically guided bombs, as the aircraft need not overfly the target. With the proliferation of good man portable SAMs, mobile radar directed AAA, automatic command to line of sight point defence SAMs (SA-8 Gecko, Crotale, Roland and Rapier) and the customary small arms fire, the low level autobomb delivery over a defended target is no longer considered a viable proposition. With terminally guided munitions, tossing the weapons allows the aircraft to avoid the point defences and engage the target with no loss in accuracy of impact. The toss bombing low level delivery using radar and Pave Tack to support a laser guided munition is one of the most difficult delivery profiles in modern military aviation. The established method is to approach the target and just prior to the release point, pull 4G for automatic bomb release. Once the weapon is released, the pilot will roll 110 degrees to kill the climb rate, and fly a steep level turn to quickly reverse heading away from the target, whilst providing the best possible field of view for the Pave Tack which must "paint" the target with its laser designator during the final seconds of the bomb's flight. Flying the toss delivery is not a trivial task, as it involves in effect a semi-aerobatic manoeuvre under instrument conditions at 500 KIAS low level. Definitely not for the faint of heart ! Approaching the target, the weapon release is armed by depressing the control column "pickle" button, the TFR is disengaged using the "paddle" switch on the control column, and a 4G pull up maintained by using the "fly-to" command bar on the ADI or LCOS, while using the strip G-meter as a cross reference. The nav attack system releases the weapon, at which point the aircraft is immediately rolled 110 degrees, after which the nose is pulled around and down to the horizon, killing the climb produced by the pull-up. Once the nose approaches the horizon, back stick is slightly relaxed to reduce the pitch rate, and opposite aileron (stabilator) is applied to reduce the AOB to 70 degrees. The 70 degree AOB steep turn is held until the nose is on the egress (escape) heading, where the aircraft is rolled level, the TFR scope is then checked for obstacles, the TFR paddle switch released and the aircraft allowed to descend below 1000 ft for a TF egress from the target area. The entry procedures to the delivery are colloquially referred to as "pickle, paddle, pull", and needless to say, timing and aircrew coordination are vital to the success and safety of the manoeuvre. The author's lack of instrument and aerobatic currency, as well as inexperience with the aircraft and the simulator's handling limitations resulted in two attempts before the manoeuvre could be flown reasonably successfully (the first attempt ended inverted over the target at 2,000 ft), even so it is evident that a high level of proficiency and precise and smooth aircraft handling are required to achieve a clean delivery. The instructor's very apt comment was that it is very demanding work, particularly if the bad guys are throwing up SAMs and AAA. 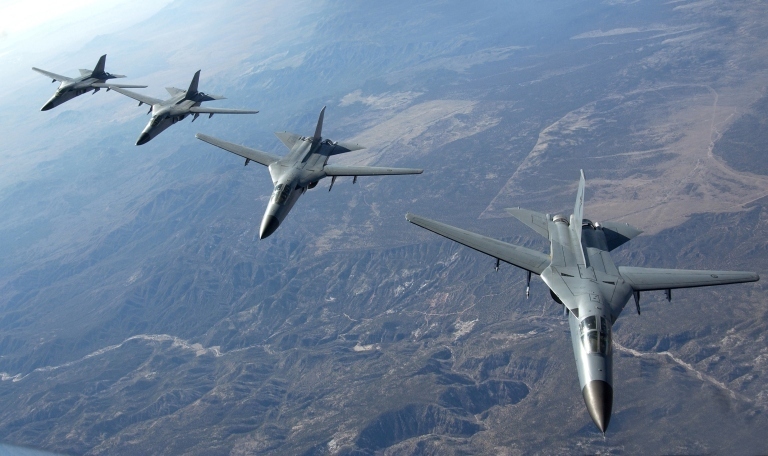 While a student F-111 pilot can be taught to fly the basic aircraft safely in less than ten sorties totalling about 20 hours, acquiring proficiency in tactical flying and weapon delivery takes 18 months or more of hard training, and well over 100 hours of time on type. Until the new AGM-142 Raptor powered StandOff Weapon is deployed, the toss delivery will remain the best method of attacking a target without being seen and engaged by area defence and point defence weapons before weapon release. Should glide-bombs such as the GBU-15 be used, toss bombing allows the crew to maximise the usable range of the weapon, and minimise exposure to target point defence weapons. Only the deployment of the AGM-142 will change this situation, by allowing high altitude standoff attacks - any laser guided bomb, GPS guided bomb or short range glidebomb will require a low level toss delivery. Aircraft without TFR, guided weapons and nav attack/sensor facilities to support this style of delivery run substantially greater risks when engaging defended targets. The fate of many RAF Tornadoes in the Gulf War, unable then to deliver self designated guided bombs, serves as a good example of what the alternatives offer in the way of survivability. No USAF F-111E/F aircraft were lost in the Gulf War, in spite of the ferocious defensive fire in the opening days of the air campaign. The 48th TFW bore the brunt of early airfield attack missions. With 20 minutes left on the clock, Steve froze the simulator while we swapped seats. The simulator has had a basic Pave Tack capability added since the eighties Pave Tack upgrade, and while this has its limitations, it can still provide a valuable insight into the difficulty of the tasks involved. To simplify the workload, we flew a level Pave Tack delivery from 15,000 ft AGL, not unlike sorties flown during the Gulf War. The first impression is that the Pave Tack VID (Visual Image Display) optics provide a sharp and clean, focussed and collimated, enlarged black and white image for the operator. The radar display retains the range ring and track line for the nav attack target aimpoint, using the right hand control handle and trigger for aimpoint position adjustment. For a conventional radar delivery this is almost identical to the now retired APQ-113. Where the radar image differs is that it has been processed by a digital scan converter, into a raster format suitable for the TV like VID displays. 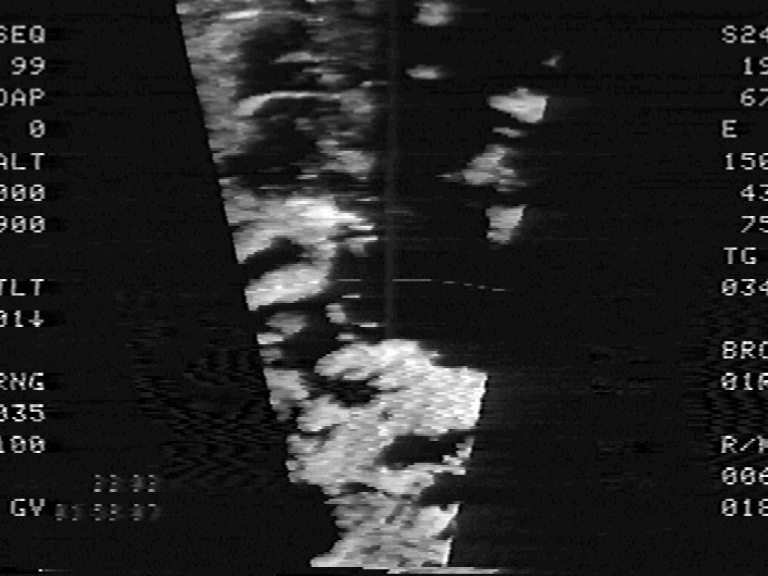 This results in a marginal loss in picture resolution, which is however compensated for by a stable picture which doesn't fade away on every antenna sweep. A conventional Pave Tack Laser Guided Bomb (LGB) delivery will involve a radar ballistic delivery of the weapon against the radar designated aimpoint, with the Pave Tack laser used during the final seconds before impact to illuminate the target for the bomb's seeker. In this fashion, should the bomb fail to guide, it will still achieve the accuracy of a radar delivery, which is cca 150 ft for the Pave Tack aircraft. This accuracy will improve significantly after the AUP introduces RLG INS and GPS. The Pave Tack pod, mounted on a rotating fuselage weapon bay cradle, is deployed several minutes before weapon release, and set in CUE mode will point at the nav attack system's aimpoint. Approaching at very low altitudes, the target is viewed on the Pave Tack thermal imager at a very shallow slant angle which may not provide the best possible geometry for identification and aimpoint selection. Once the aircraft pops up for its delivery the Pave Tack will have a much better view of the target, and at this point the Navigator will adjust the Pave Tack cross-hairs for the precise aimpoint on the target, such as a window, air vent, lift shaft or other channel which will ease the bomb's penetration into the interior of the target. As the Pave Tack VID allows the Navigator to swap radar and thermal imager pictures between the two screens, he may use the alternate screen as a cross check when acquiring the target. Selection is made with a pushbutton on the left of the hood. The Pave Tack aimpoint is adjusted using a pressure sensitive thumb switch on the control handle, and is rate aided - a sustained pressure in any direction will cause the aimpoint to rapidly move across the target, very useful should the initially set aimpoint have been imprecise or mis-identified. The Pave Tack display includes slant range to the target, as well as TTG (time to go) before weapon release, and computed TTI (time to impact) after weapon release. Eight to ten seconds before weapon impact the Navigator will fire the laser to paint the target, using a little red button on the control handle. Once the laser is painting the target, the bomb's seeker will steer it to impact. Accuracy varies with weapon type, and the proportionally guided GBU-24/27 used in the Gulf, and recently acquired by the RAAF, has a demonstrated CEP below ten feet. The greatest difficulty in a Pave Tack delivery results from task saturation, as the Navigator must not only handle weapon delivery via the radar and thermal imager displays, but is also responsible for the aircraft's electronic countermeasures which often must come into play as the target is approached. Shifting the system aimpoint from radar to Pave Tack is also very difficult (not unlike the problems experienced by Lockheed when designing the F-117A nav-attack, transferring the aimpoint from the nose mounted Flir to the ventral Flir/designator proved to be extremely difficult, even for a fully automated system), as the Navigator must quickly and accurately identify the visual aimpoint and adjust accordingly. The target must be manually tracked to bomb impact if high accuracy is sought. The simulator sortie made this very clear, and the author had considerable difficulty in coordinating the radar and Pave Tack aimpoints. It might look like a space invader game, but it definitely is a lot harder to do for real. 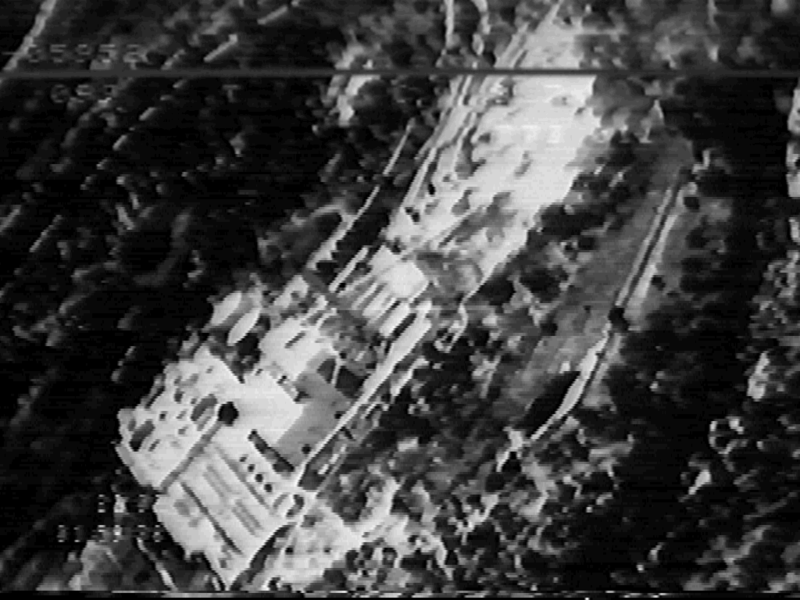 As we flew over the target, the Pave Tack aimpoint cueing kept the crosshairs on the roof of the targeted building, the image motion no different from the Gulf War tapes we have all seen on television. Off the target, time ran out and I sadly had to part with a wonderful piece of machinery. Unfortunately the limited time and capabilities of the soon to be retired simulator meant that we could not try other Pave Tack modes, such as Left and Right Acquire and Snow Plow which are used to visually acquire targets along linear features such as roads or railways. This mode was used extensively in the Gulf for "plinking" tanks and trucks with 500 lb GBU-16 LGBs. A competent operator with a string of targets along a road (eg convoy) will pickle multiple bombs, say fifteen seconds apart, lase the first target, on impact the aimpoint to the next, and continue until his string of targets is obliterated. Given the skill required to kill a single target cleanly, doing a string of targets in this fashion is truly an artform. Pave Tack is a demanding weapon system, and a navigator newly introduced to the system will require 18 months or more of focussed hard effort to acquire combat proficiency on the system. The diversity of modes and attack profiles, and the need to also handle the aircraft's electronic defences make the F-111 Navigator's life one of the most difficult and demanding flying careers in the service. The Weapon System Support Facility (WSSF - "wussf") is an F-111 crew module, wired to an F-111 forward fuselage section, fitted out with the full offensive avionic suite, and tied to a simulation system which emulates the aircraft's environment. Initially devised as a testbed for debugging and validating the software and hardware in the offensive avionic suite, the WSSF will also become a ground training tool to allow aircrew to become familiar with the new digital avionic suite, as well as a diagnostic tool for testing suspect black boxes. The RAAF provided the author with access to the WSSF and an instructor to explain the operation of the systems. The AUP systems will provide a quantum leap in managing aircrew workload. The two Multi Function Displays (MFD) subsume the functions of a myriad of switches and controls on the old analogue systems, and are very easy to operate. The ICNIS Control and Display Unit (CDU) panel provides pushbutton control for the comprehensive suite of communications equipment on the aircraft. Significantly, the MFDs and system software provide the crew with much flexibility in configuring the weapon system, selecting modes and weapons. The master page sits at the top of the menu tree, from where the navigator can select pages for navigation as well as weapon delivery. Typically one MFD is used for mode selection, while the other provides a status display. The navigation pages allow the selection of the primary navigation reference from either SINU (INS) or the GPS, and the system will automatically configure the secondary references. Weapon delivery pages are available for ballistically delivered weapons (eg dumb or laser guided bombs), air to ground weapons (GBU-15 or standoff weapon), Sidewinder AAM and Harpoon ASM. Each of these pages provide specific menus for selecting and configuring the weapons in question. A proficient operator will be able to reconfigure for alternate weapon delivery in seconds. Waypoints and aimpoints can be updated manually, via pushbutton if required. This may be on occasion required, although most mission parameters are uploaded into the system via a DTC cartridge, plugged into the Data Transfer Unit (DTU) receptacle in the cockpit. Missions are planned on a laptop PC hosted mission planning software package, which also generates maps on a laser printer, flight plan hard copy and programs the DTC cartridge. In the limited time available the author had the opportunity to move through about a quarter of the pages which the system can display. The real time response of the computers to pushbutton inputs is almost instantaneous, and the green monochrome display is sharp and clean with no observable flicker. The impression is not unlike that of a commercial EFIS control panel, but with much quicker response times. The computer performance is evidently well matched to the computing load, always an issue with a real time system. The F-111 is a potent and highly capable weapon delivery platform, demanding a very high level of proficiency from its aircrew. With it's unmatched combat radius, pinpoint accuracy and impressive aerodynamic performance, the aircraft is both a highly credible strategic deterrent, and if called upon, a very effective and flexible offensive tool. Special thanks to 82 Strike Reconnaissance Wing at RAAF Amberley, Group Captain Peter Growder (then OC 82 WG), Squadron Leader Steve Clarke (then ALO 82 WG) and the Amberley AUP project team. A8-140 with weapon bay open and AVQ-26 Pave Tack pod deployed.